Over the years we have archived articles and tutorials/screencasts that feature our many tools for affiliates, and much more. We also offer monthly topic-driven or specialty webinars highlighting everything from affiliate marketing best practices to promotional tips for the season. Each network-integrated tool has a dedicated screencast accessible from its respective tool page available in the Affiliate Tool Center. Browse the tutorials, and if you still have questions or cannot find an answer in our archives, email our support technicians. We pride ourselves on fast (generally same day!) and responsive support. Our technicians are experts on the platform and outstanding communicators. For easy access to support, simply send a message directly to the support queue by using email: support@avantlink.com. 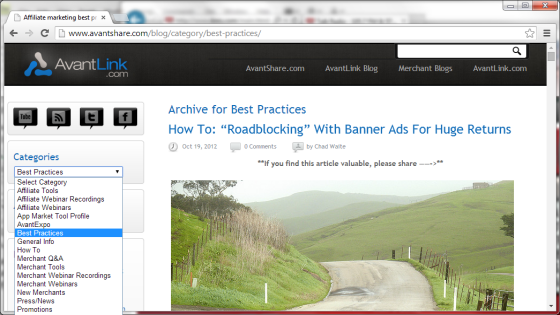 There are many articles on our tools, general best practices and even some affiliate industry insight. All of our articles (and all other content) are accessible from our network blog. Specifically, note the following categories: Affiliate Tools, Affiliate Webinar Recordings and Best Practices. Reach out to our support team if you have questions on any of our network technology. We have an array of affiliate tutorials and video screencasts organized into relevant playlists at the AvantLink YouTube channel. Be sure to subscribe at YouTube because this library continues to expand as we add new tools, or make upgrades to existing tools. Browse the playlists for all affiliate videos by clicking the image below. Use WordPress? If so you should learn about our plug-in.